The Phireplace Pharmadasi you can predictably find in Appliances -> Cooking, for $650. It has 1900 polys, but that’s on three tiles so it sounds worse than it is. and she has better things to do than participate in this nonsense, thank you very much! Fireplace stove No. 2 is the Jacoban Fireplace for $1450, also found in Appliances -> Cooking. 3500 polys; again on three tiles but still in the range. If you’ve played TSM you can tell that I’ve edited the mesh quite a bit; to keep the poly count out of “ouch!” territory (and because it would be inside the ceiling and you wouldn’t be able to see it anyway), I’ve removed the top part. I’ve also removed the dangly ladle thingies in front; they weren’t high poly in any way, but the textures were awful. This fireplace stove comes in five of CuriousB’s ACYL colours + the TSM original. You can mix and match the statue-deco part and the brick part, just be aware that if you delete a recolour you delete it for both parts. The fire in the fireplace will burn at all times – but don’t worry, it won’t spread, it’s not that kind of fire. (That doesn’t mean your Sims can’t still burn the house down if they don’t know how to cook, though.) When the stove isn’t in use the pot is empty, but as soon as someone starts cooking it will fill up with a steaming stew, just as in the title picture. Also like in the title picture, when the Sim is cooking on the stove you won’t see the saucepan/frying pan. This is by design, to make it look as if the Sim is stirring the stew. They’ll still use a spatula when they’re frying something, though; I didn’t want to mess with that, even though stirring with a spatula looks a little silly. Also, the pan will reappear when the Sim has finished cooking the meal – I didn’t want to mess with that, either. Then there’s the light. 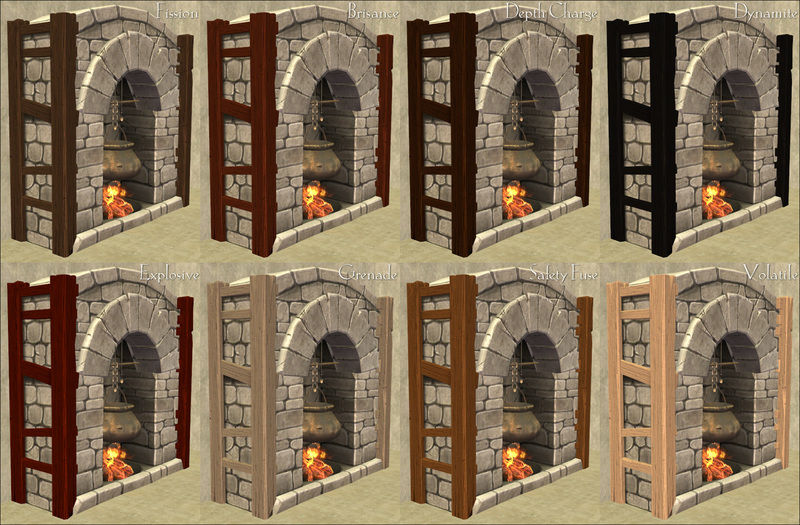 You know how real TS2 fireplaces spread this nice, warm, cozy light? 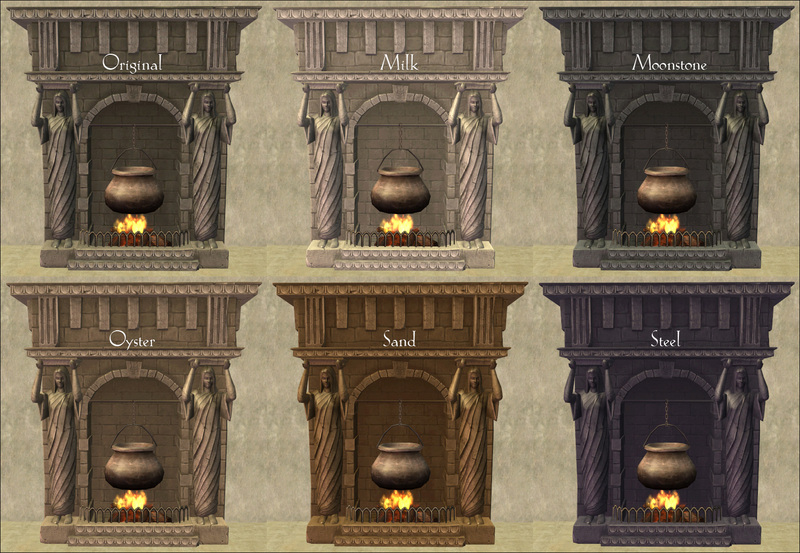 I really, really wanted my fireplace stoves to do that as well, but whenever I tried to add a light to them my testing game crashed on startup (yeah, that’s bad), so I scrapped that idea pretty quickly. Instead of making the actual stove spread that nice, warm, cozy fireplace light, I made a lamp that spreads that nice, warm, cozy fireplace light – and that you can put in the stoves. Note: Depending on how the planets are aligned the time of day, sometimes when you’ve placed the lamp and have turned it on for the first time, you might need to pick it up and put it back down again to get the right glow. This entry was posted on 23 December, 2013 at 20:33	and is filed under Appliances, BUY MODE, CONVERSIONS, DOWNLOADS, Lighting, Medieval-ish, Objects, THEMES, TSM. You can follow any responses to this entry through the RSS 2.0 feed. You can leave a response, or trackback from your own site. Incredibly divine, extraordinary technical achievement. Brilliant! This is a delight. Thank you, Johanna! Merry Christmas! Awesome job, Nix. Thank you. I have to agree with Nonni! It’s not only fantastic with all the recolors, but making an object do (what is supposed to be) two separate functions into one object, is awesome! This is amazing! I must have it. As always, the attention to detail is flawless and the way you handled the lighting issue is innovative. Happy holidays, Nix, and best wishes for 2014. Happy holidays to you, too! I hope 2014 is a great one! I`m agree its amazing! Never thought itpossible… Thanks a lot once more! Again, thank you for commenting! Amazing! I can’t wait to try these out. On top of it all you did a great job remaking the mesh for the Jacoban fireplace, I didn’t think it was possible to reduce the height that much and still have it look good! OMG this is amazing!!!!! It looks SO good! I haven’t found anything like it! Thank you so much!!!!! Wow, Nix! Just jumped over here from PBK and happened to find these, the’re fantastic. Many thanks for your efforts.